Posted December 5, 2016 by Norburn Lighting and Bath Centre & filed under Contest Giveaway . 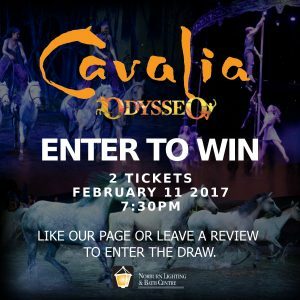 We have two Cavalia tickets to giveaway! To enter the draw, like our facebook page or leave a facebook review about your experience at Norburn Lighting and Bath Centre. Your name will be entered twice if you like our page AND leave a review. The winner will be chosen January 28, 2017.